Tied at halftime, USD women’s basketball returned to form in the second half of a 71-49 victory over Purdue-Fort Wayne in Indiana Saturday. Fort Wayne (6-16) led 17-14 at the end of the first quarter, but the Coyotes tied the game by halftime, 34-34. The first half saw nine lead changes and eight ties. Senior Allison Arens led the Coyotes in the half with 12 points and five rebounds. Junior Ciara Duffy contributed 10 points. The Mastodons shot 52 percent (12-23) from the field in the first half against a Coyotes defense which allows 38.1% on the season. The Coyotes lead the Summit League in shooting percentage allowed and points per game allowed (59). South Dakota’s offense turned up the heat in the third quarter, scoring 24 points in that time frame, which accounted for over a third of their 71 points in the game. While the offense built a 58-42 lead for the Coyotes at the end of the third quarter, the defense ensured that the lead would not be squandered. The Mastodons were held to 15 second half points, including seven in the fourth quarter. Purdue-Fort Wayne shot 21.7 percent (5-23) in the second half and 37 percent for the game. South Dakota’s seven points allowed in a quarter is far from an anomaly. 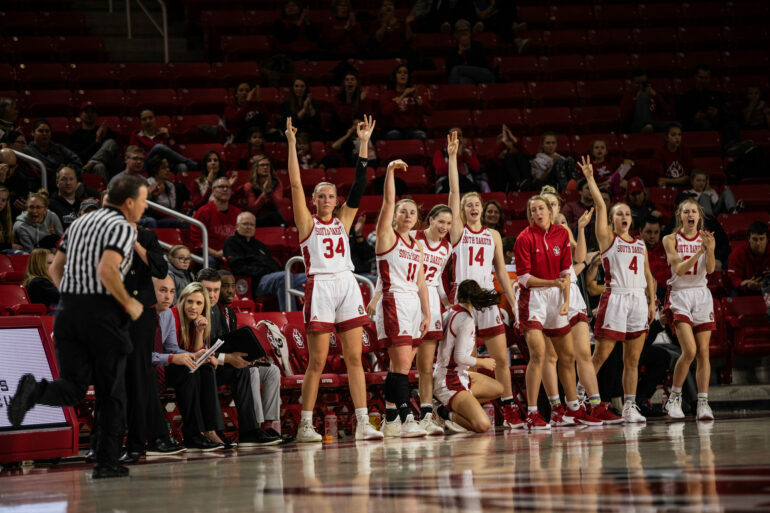 The Coyotes have replicated that feat in five out of their last six games, including four points allowed in the second quarter against Fort Wayne earlier this year, according to GoYotes. Arens and Duffy continued to lead the Coyotes offensively, both players finishing with 19 points. Arens knocked down six field goals and six free throws in 35 minutes. Taylor Frederick tallied 15 points, including three 3-pointers. Frederick added six of the team’s 13 steals. Arens, Duffy and Frederick combined for 53 of the Coyotes’ 71 points. USD extends their winning streak to seven games, pushing their record to 20-3 overall and 8-1 in Summit League play. This is the fourth consecutive game where the Coyotes have held their opponent to 50 points or less. Of nine conference games, the Coyotes have held their opponent under 52 points six times. The defense is not the only impressive part of this stretch for the Coyotes. Their average scoring margin in conference play is 19.9 points per game. They have won four straight by 25 or more points. For the season, the Coyotes scoring margin is eleventh in the nation at 18.6 points per game according to NCAA.com. USD is also tied for second in the country in free throw percentage at 78.5%. The Coyotes have received votes in the AP Top-25 for ten consecutive weeks and votes in the Coaches Poll for nine of the last ten weeks. The Coyotes are three points outside 25th place. Miami (FL) currently hold the 25 spot with 20 points. USD appeared on one more ballot than Miami, but it wasn’t enough to get in. The latest CollegeInsider.com mid-major rankings have the Coyotes in third behind Gonzaga and Drake. The latest espnW mid-major rankings have USD in the top slot with rival South Dakota State in second. Up next for USD is a home rematch with Omaha Wednesday, Feb 6. The last time these two teams met, the Coyotes beat the Mavericks 80-49. Omaha is last in the Summit league at 1-8 in conference play and they are 7-15 overall. Tip-off is scheduled for 7 p.m. inside the Sanford Coyote Sports Center.